The Nordic Network in Metaphysics is an informal network of those philosophers in the Nordic countries (Denmark, Finland, Iceland, Norway, and Sweden) that have an interest in metaphysics. It is open to whoever wants to be associated with the network. The aim is to arrange one meeting per year, democratically rotating the responsibility of organisation between the Nordic countries. Nordic Network in Metaphysics is up and running! 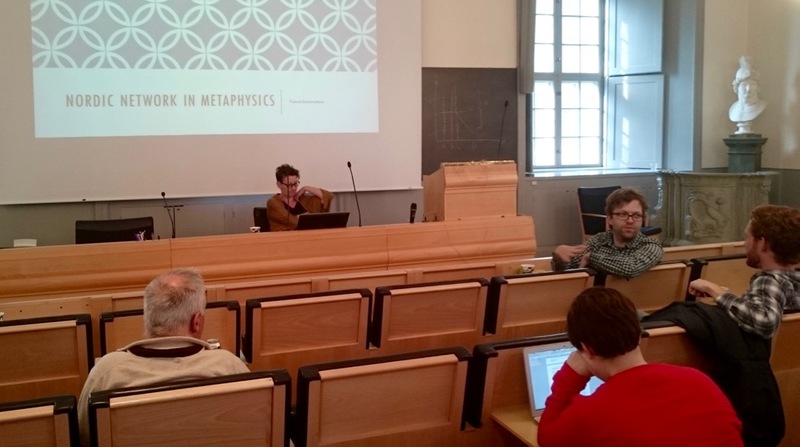 The inaugural meeting of the Nordic Network in Metaphysics was held in Uppsala, Sweden, on the 20-21 October 2015, on the initiative of Anna-Sofia Maurin and Matti Eklund. The event gathered around 20 metaphysicians from Finland, Sweden, Norway, Denmark and Iceland, who unanimously disagreed (each in their different way, of course) to the content of inspiring talks from Einar Duenger Bohn, Markku Keinänen, Johanna Seibt, Tobias Wilsch, Eyja Brynjarsdóttir, and Tobias Hansson Wahlberg. Admittedly, Jani Hakkarainen at one time noted, in a surreal moment, that he “almost completely agreed” with a speaker. This was naturally qualified immediately with how exactly he still disagreed. We are happy to conclude that consensus was only achieved about non-philosophical matters, such as the format and organisation of the Nordic Network of Philosophy. It was decided that the network will be an informal and inclusive affair, gathering once a year, rotating the responsibility for organising meetings between the nordic countries. The next meeting will be held in Norway, and then in Finland in two years time. Well met!